A.C. Buchanan lives just north of Wellington. 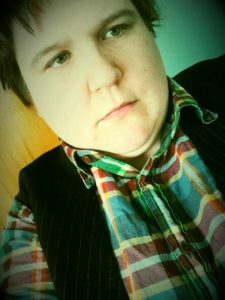 They’re the author of Liquid City and Bree’s Dinosaur and their short fiction has most recently been published in the Accessing the Future anthology from FutureFire.net and the Crossed Genres Publications anthology Fierce Family. Because there’s no such thing as too many projects, they also co-chair LexiCon 2017 ? The 38th New Zealand National Science Fiction and Fantasy Convention and edit the recently launched speculative fiction magazine Capricious. You can find them on twitter at @andicbuchanan or at www.acbuchanan.org. 1. What inspired your story? A chapter of my MA thesis focused on John Wyndham’s The Day of the Triffids and as part of my research I began exploring the tiny “floral apocalypse” sub-genre – which can be summarised as “plants gone bad”. I wanted to experiment with writing this kinds of story – but also to see what the genre would look like when removed from its overwhelmingly English, mid-twentieth-century setting (although I enjoyed adding a few direct references to The Day of the Triffids into the story, which I hope some readers will pick up on). I’ve also thought a lot (it perhaps comes from living next to a major fault line) about decisions people make in the face of danger, when they stay and when they decide to leave. I wanted to create a slow apocalypse, one in which people treat each other well, until they don’t, and one in which the decisions they make are sensible, or at least understandable, until they’re not. When I’ve written this type of story before it’s been characterised by emptiness and abandonment, wide-open, disintegrating spaces – so this time I tried to add a sense of claustrophobia to the isolation, the forests closing in day by day. I chose kelp (which is being explored as a renewable energy source in reality) mostly because it was a different type of “plant gone bad” to those I’d read about before but as the story went on it added its own flavour to my writing. Somehow German fairy tales found their way in too, and in the end it ended up as much about stories as anything else; about the stories we carry with us, and the impact they have which isn’t always within our control. 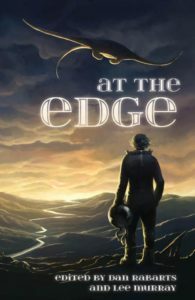 I’ve previously co-edited two volumes of New Zealand speculative fiction, so I was thrilled to see others giving it a go (although this time extending it to include Australian specfic as well) and interested to see what spin they’d place on it. There was clearly a great team behind making it happen, and I also loved the choice of theme; not too restrictive, but enough to generate ideas. While the word-count might seem to be restrictive, I love the flexibility and creativity that is possible within short stories, the ability to experiment with form, and how much can be said by what is left unsaid. I seem to be in a constant cycle of reading fiction I love so much that I simultaneously want – no, need – to write something inspired by it, and am left feeling so intimidated that I don’t know how I could possibly write again when there is work this good out there in the world. I have another very clear memory, from my mid teens, that relates back to my previous answer. I worked in a public library on Saturdays and took the liberty of flicking through books as they were returned. One of the stories I came across was James Kelman’s “Acid” which is this tiny, brutal story of only 150 words or so and yet carries more meaning and emotion than many novels. I remember standing there, stunned (and I stayed that way for a long time – perhaps I still am) not just at the horrific nature of the piece, but that so few words could do so much. Even though there are some standout experiences, this keeps happening one way or another. Today I read A. Merc Rustad’s “Iron Aria” and was blown away – I just wanted to write something that good. I hope I never stop having this feeling! I always have short stories on the go – right now I’m writing one about a post-industrial town that moves of its own accord, and experimenting with some interactive fiction pieces. When it comes to longer fiction, I’m working on a short novel called Ice Flight, which is set in the same world as my earlier novella Liquid City, and planning an urban fantasy series set in Wellington. I also edit a speculative magazine, Capricious, so there’s always work to be done on that – I’m currently putting the finishing touches on Issue 4, which is food and drink themed and which I’m very excited about. This entry was posted in News and tagged A. C. Buchanan, A. Merc Rustad, At the Edge, Australian spec-fic, Dan Rabarts, James Kelman, John Wyndham, Judith Kerr, Lee Murray, NZ spec-fic, Paper Road Press, The Day of the Triffids. Bookmark the permalink.